For Jan. 18 of the 2019 Oregon high school basketball season, here's a look back at the Plays of the Day. To see complete game stories from all these contests, go to the Prep Basketball Tab. GRESHAM 61, CLACKAMAS 60: After Ethan Abrahamson made two free throws to give Gresham a 58-57 lead with 23.1 seconds remaining, the junior guard blocked a shot by Clackamas' Jailen Hammer, grabbed the loose ball, got fouled and made the first of two free throws to extend the Gophers' lead to 59-57 with 9.8 seconds to play. After Abrahamson missed the second free throw, Gresham got the rebound and called timeout, then inbounded to Abrahamson, who was fouled and made both free throws for a 60-57 lead that effectively put the game out of reach with 6.2 seconds left. 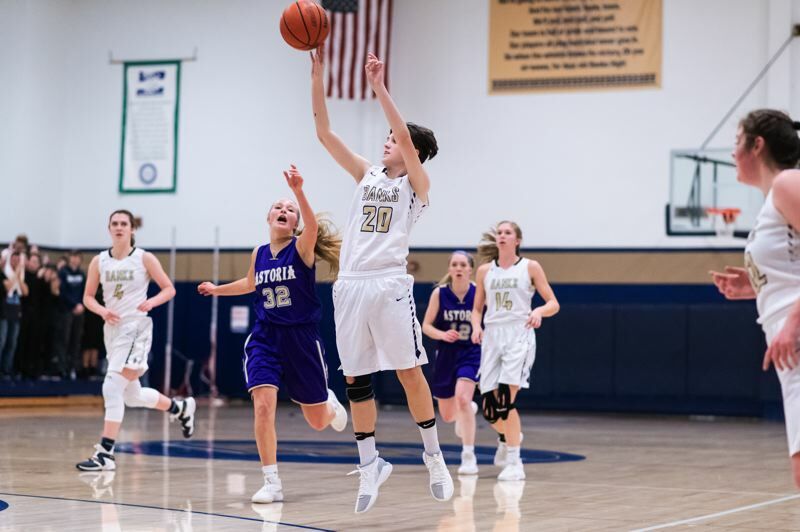 BANKS 51, ASTORIA 32: With Astoria leading 6-0, Banks' Gracie Nelson and Maddy Shook hit back-to-back 3-pointers, followed by consecutive baskets from Aspen Slifka that sparked a 19-0 Braves run, ending a key Cowapa League contest before the Fishermen seemingly knew it got started. OREGON CITY 61, TUALATIN 60: Oregon City was clinging to a 59-56 lead over the Timberwolves with less than 30 seconds to play in Friday's Three Rivers League game. But that's when Pioneer senior guard Corban Remsburg drove to the basket for a layup which gave Oregon City a 61-56 lead with 23 seconds left to play. The Pioneers ended up holding on for a 61-60 victory in the contest at Tualatin High School. SOUTHRIDGE 65 MOUNTAINSIDE 43: Midway through the third quarter, Southridge senior post Ross Davis Jr. skied for a putback tip dunk, and on the very next trip down the floor, erased a Maverick shot with an emphatic rejection to push the Skyhawks' lead to 44-29. From the 4:30 mark in the second quarter through the 4:25 mark in the fourth, Southridge gave up just 11 points. WOODBURN 60, NEWPORT 59 (OT): With Woodburn trailing Newpot 59-58 and struggling to find any offense in overtime of Friday night's Oregon West Conference game against the Cubs, senior guard R.J. Veliz found a lane through the defense with 30 seconds left and carved his way to the basket for the game-winning layup. TIGARD 69, LAKERIDGE 59: With his team trailing Lakeridge 36-33 following a Ryan White 3-pointer midway through the third quarter, Tigard senior wing Stevie Schlabach took over. He scored nine of his 17 points in a span of just 2:30, beginning with a three-point play that pushed the Tigers in front 40-36 with 2:33 to go in the period.